All users should ensure they have read these terms and conditions. Last post HOLD function not working. What's the MPG like? Can I use chip fat and veggie oil? What about LPG? Questions & answers about kitchen units, stoves, fridges, heaters, water tanks, seats, mattresses etc etc. 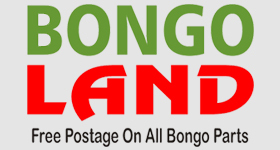 If you are a private individual and are breaking a Bongo for parts, post brief details here. Once posted, the thread will be locked and all correspondence must be by PM or email. You can request a moderator unlock the thread for you to post an update. Stuff about the website, the forum and club administration. Questions & answers about awnings, mattresses, and other things to make life on the road more comfortable. This section is for Bongo-specific kit only. No talk about backpacking tents here! This section is for when either the club or individuals are buying en-masse for the benefit of the Bongo community at large. Read the rules first! Pets like Bongos! Anything to do with dogs, cats and other Bongo animals, you can post here. But please keep photo sizes within limits. This year's bash will once again be at Stourport-on-Severn and will run from Wednesday 22nd June to Sunday 27th. Last post Re: From above. Once again we will be returning to Stourport on Severn for our annual rally. This year's main event will be held at Stourport on Severn, Worcestershire. It starts on Wednesday 19 June and runs through to the following Monday. You must be a paid up member of the club to attend, although non-members are welcome as day visitors. We have room for 300 Bongos on site. Children & dogs welcome! This is the largest gathering of Bongos anywhere in the world and takes place at our spiritual home, Stourport on Severn 20 to 25 June. Plan and chat about this joint meeting with the Russian Bongo owners club. Last post Re: It's Nice to be Nice! Be part of the big one! Over 250 Bongos in 1 field! Live bands and much more! Lickhill Manor, Stourport on Severn, Worcs, Wed 16 to Sun 21 June. All anouncements, enquiries and the memories from the 2007 Bash. For all owners and afficionados of Mazda Bongo Friendees and Ford Fredas based outside of UK or Ireland.